Jane Austen was born on December 16, 1775 at Steventon, a small village in the county of Hampshire in Southern England. She was the second of two daughters and the seventh of eight children born to the Reverend George Austen and his wife Cassandra. The Austen family lived for the early years of Jane’s life among upper middle class society in Steventon where Jane’s father was a minister of the Church of England. While not at all wealthy, the family was comfortably off and enjoyed a sociable life, travelling around the countryside to see friends and relatives on occasion. Jane Austen began her writing career when still a girl, having been a great reader of any books she could lay her hands on. She created the body of work now referred to as the Juvenilia from 1787 to 1793. Three of her major novels “Sense and Sensibility”, “Pride and Prejudice” and “Northanger Abbey” were started between 1795 and 1799 although none were published until much later. The family moved to Bath in 1801 after Rev. Austen decided to retire at the age of 70 and this re-location afforded Jane her first real opportunity to observe daily life in an urban setting. Bath society, with its shops and fashion, assemblies and concerts so familiar to her readers, contrasted sharply with the country living of earlier years. Four years after he retired, Rev. Austen died and, without the regular income from his various clerical livings, life for the Austen women changed dramatically. Jane, her sister Cassandra and their mother had now to rely on the sons of the family to come to their financial rescue. Jane wrote less at this period of her life, perhaps due to changed circumstances and new demands on her. Soon there was another move, this time to Clifton near Bristol, and then to Southampton, a southern port town. 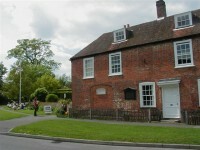 The final move for the three women, who were now joined by their friend Martha Lloyd, was to Chawton Cottage near Winchester in the picturesque English countryside. The cottage was on the Chawton estate of the Knight family. Jane’s brother Edward had been adopted by the Knights when he was a child and he had inherited after being brought up with great expectations. It was Edward who suggested that his female relatives settle in the former bailiff’s cottage on the estate. Around this time, Jane began to write regularly again and, in October, 1811, the first of her published novels, “Sense and Sensibility”, appeared with “By a Lady” substituted for the author’s name. In fact, none of her novels ever carried her own by-line. “Pride and Prejudice” was published in 1813, followed by “Mansfield Park” the following year. 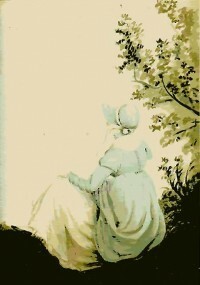 “Emma” appeared in 1815, and proved to be the last novel published during her lifetime. Neither “Northanger Abbey” nor “Persuasion” came out until after she had died on July 18, 1817. Jane’s brother Henry was responsible for the posthumous appearance of both books. 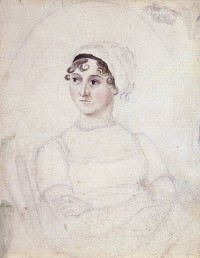 Portrait of Jane Austen (c. 1810). Watercolor and pencil, by Cassandra Austen. Her final resting place was in Winchester Cathedral. Other fascinating sources for Jane Austen devotees are her letters, most of which were written to her sister Cassandra. The voluminous correspondence contains scenes of daily life and details the amusements of a young lady in society as well as her reflections on those she met and admired (or detested!). Knowing that Jane Austen lived during the Napoleonic era is enough to know that her times were turbulent, both socially and politically. None of this, however, is overtly reflected in her novels. While her seafaring brothers (two were in the Royal Navy) must have had many thrilling tales to tell and she had close connections to people in France during the French Revolution, her books are invariably concerned with interpersonal relationships among those living in a small circle. In 1776, just a year after her birth, the new American Republic came into existence and only a few years later India was brought into the British Empire. With the break out of the French Revolution in 1789, we have the beginning of one of the most tumultuous of historical times. For example, Jane would have been a young woman of 23 when Napoleon overthrew the French Directory. Various battles were fought during her lifetime which reshaped the world, including the Battle of Trafalgar in 1805 and the Battle of Waterloo 10 years later, just two years before her death. While historical references are missing from the stories of Jane Austen, and there have been those critical of such omissions, perhaps this is just one clue to the question of why she has remained such an admired novelist to the present day. While politics varies widely from decade to decade and century to century, people themselves seem to hardly change at all. Within Jane’s stories, we recognize our neighbours and, perhaps to a lesser degree, ourselves. Do we have a hypochondriac in our lives like Mr. Woodhouse? Have we come across social climbers like Sir Walter Elliot and his daughter Elizabeth? What about those who cannot resist the chance to boast of their accomplishments and well-heeled friends such as Mrs. Elton? Of course Jane would have known about most everything that was occurring in the wider world, but her pen, creating its tales on a “little bit of ivory” explored instead the innermost feelings of the hearts of her characters. In this, in the opinion of her legions of fans, she has no equal.